When we got together in 1986, we had this studio photograph taken in Barrowford. 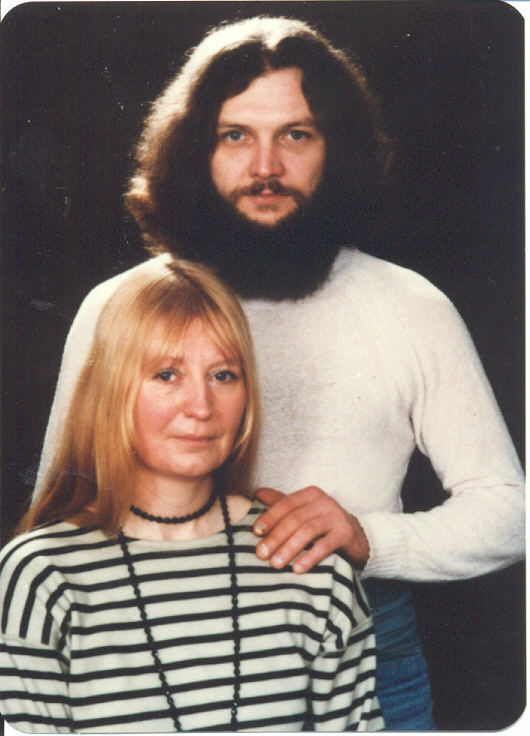 Wolf was 31, I was 45. Look at that face. Can you see why I fell in love? Sometimes, in pubs late at night, men would fall at his feet crying, "Lord Jesus! Save me!" And they weren't joking. Drunk, probably, but not joking. There is a bit of Yorkshire Grit about my mouth and jaw, I think, but Wolf looks transcendental! When I met Wolf, in the George and Dragon, he was in full flight with his fantasies. I didn't know what to do about them. I didn't want to embarrass him by telling him I didn't believe them, and I hoped he wasn't doing it to impress me, because he was impressive enough all on his own! I didn't need to think he owned two recording studios, a Ferrari and an E type, and I wasn't going to believe it when, whizzing past on my bike, I saw him waiting at a bus stop, bag of washing in his hand, on his way to the launderette, or when he tried to bum a pound off me for tobacco, because his accountant had left him a bit short over the weekend. Poor lad! How could I tell him he was all I wanted? by menfriends and lovers alike, to the life I had to lead with Wolf. Being blind, he had no car, but losing the job with Gillibrand was the biggest blow. As a married couple we received very little state benefits. I could have gone back to work, but the few times I tried part time work Wolf spent the time of my absence in the pub. Putting the kindest interpretation on it, I decided that he needed companionship more than anything, and set myself to create a satisfying life for us without work. Wolf had a mini-recording studio setup in his rented house, which he brought with him, and over the years he gradually improved and built up his equipment. I never understood anything about it, but he had a well-developed ear for sound technology - one of the benefits of being blind I suppose, and with his interest in music, bands and singers naturally gravitated to him, or heard about him on the grapevine, and afternoons at our house often consisted of singers bleating into microphones and filling the air with their tobacco smoke, singing and smoking apparently being mutually compatible pastimes. I had already begun studies in astrology, and my little Sinclair ZX Spectrum and one solitary astrology tape was succeeded by an Amstrad PC 1512 in the late 1980s, a present from Wolf with some of the money he inherited when his grandfather died. This could run an astrology program - I chose Astrocalc which I still use today - and a word processor, but not at the same time. You had to close one down then open the other. There was no internet then, and even when it came, the Amstrad was not capable of running it. It was not until I upgraded to Packard Bell in the late 90s that we came of age technologically, and that was thanks to Wolf. I said why did I need internet? He said always get the machine that is capable of the most. So we did. But that comes later. When I saw the 'plots vacant' notice on the allotment gate I immediately wanted one. 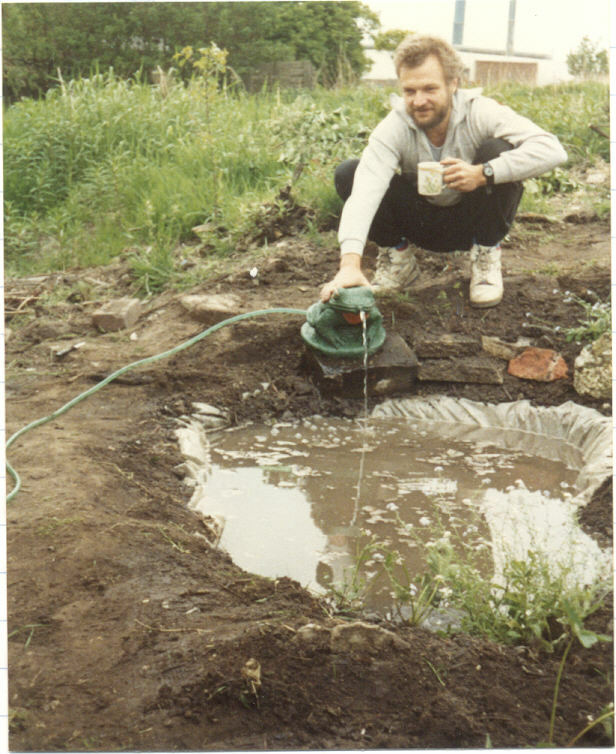 The excuse was that it was for Wolfram, but allotments had always fascinated me. They looked like secret worlds, and I wanted to know what went on in there. The Secretary was an old curmudgeon, and he disapproved of us from the start. I think he only gave us a plot in order to have the pleasure of turning us off it, which he had done with others before us. Wolf was not keen at the beginning, and I often found myself on the plot on my own, but gradually he came round, and in the end was there as much as I was. getting the local radio involved and they opened a helpline where anyone with stuff to give away phoned in, those needing it phoned back, and many userful things were passed on, and friendships forged. I wrote a column in the Nelson Leader from 1990 to 1995, and people often got in touch through this, wanting to visit our gardens. One man came and chatted a while, then turning to me he said, "You're not from these parts," and I had to admit I was from Yorkshire. "But," he said, turning to Wolfram, "I know a Barrowforder when I hear one!" - "As a matter of fact," Wolfram told him, "I'm from the Black Forest." I put it down to his musical ear. In the 90s we joined some sort of committee set up by the local council to advise on recycling. We had lots of information and ideas which were all ridiculed - they had no intention of doing anything in the ten years they were supposed to spend preparing - as is usual in this money-oriented economy, they waited til the tenth year then asked for more time. Those meetings were a total waste of time and money - one year they used the entire budget of £10,000 to buy low energy lightbulbs for the town hall. In the end we left in disgust. Anyway, the only kind of meetings I enjoy are those where I am talking. Our 'finest hour', however, came in 1991 when the obnoxious Mr George Wilkinson tried to put us off the allotments. I had invited our Mp to visit our allotment, he had done us a good turn in getting some fencing put up, and anyway I wanted to get him interested in allotment causes, and raise the profile of organic gardening. I informed George Wilkinson of his visit, so he could also be there. The man said not a word, then this almighty furore broke out, which the local press dubbed 'A Storm in a Plantpot'. The Mp visited, we stood our ground, said it was our human right to have our local representative visit our plot. Turned out Wilkinson was a rabid communist, trained in Moscow. 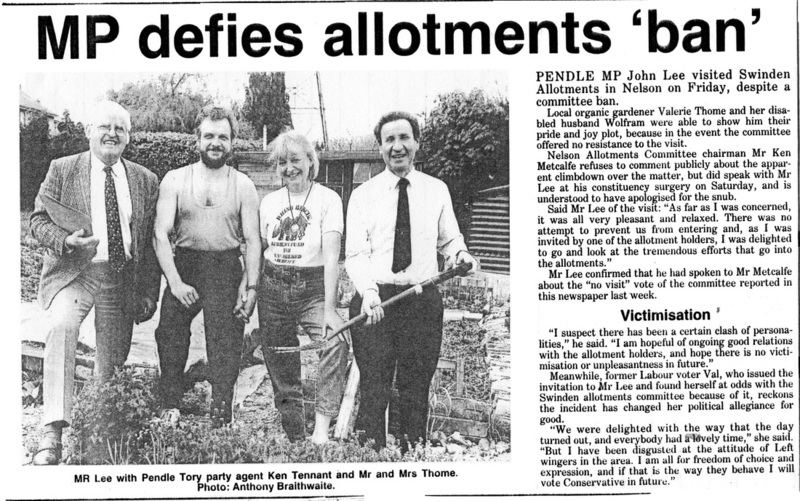 I am no Tory myself, but John Lee was elected to represent us, and that's what he did. What with all this, and the after-hours witchcraft on the plot, attractive young ladies robing up in the shed, and feasting and drinking afterwards into the small hours, it was a wonderful world down on t'plot!